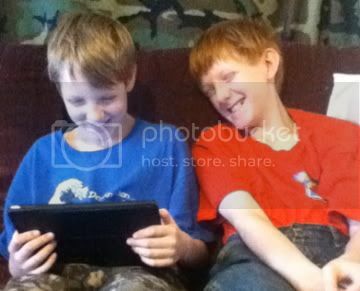 Two boys, ages 10 and 12, huddled on the couch, watching a video on the iPad and laughing. I'll start with what my kids say. "I think it is FUN!" says Thomas (age 10, in the blue t-shirt). "This is definitely my favorite way to learn Latin," adds William. "He is funny, which makes it interesting to watch instead of something you just want to tune out." When I asked if he feels like he is learning Latin, William stated, "YES. I don't know how to put it for your review though. But I am absolutely learning Latin this way." I haven't blogged a whole lot about Latin in our homeschool, but people who have known me since my yahoogroups days definitely know that it is important to me. Connor has been plugging away on Latin, but in spite of owning a bazillion Latin programs, I simply have not figured out anything that I like for my next two. Until now. Video. That is a definite must-have. My boys learn so much from watching a video. This one is non-negotiable. Obviously, Visual Latin meets that requirement. A male instructor would be a huge plus, or at least an instructor that "gets" boys. Without even watching the video clip, you can see that Visual Latin does have a male instructor. I like that his voice is clear and easy to understand. Sometimes it is tough with a female instructor... too soft-spoken. Not the case here. Something to truly grab their attention and make it fun. So many programs have some really cool things included to make the program fun -- games, puzzles, stories. While a lot of that worked fairly well for Connor, my next two, well, not so much. They don't want a lot of words on a page, and they definitely don't want Latin crossword puzzles. Dwayne Thomas is FUNNY. He connects with them. He engages them. And it doesn't require them to read much of anything (occasionally there will be something like a sentence or phrase on screen, usually something amusing). It needs to not involve a ton of pencil work. Visual Latin has three pages of worksheets per lesson, that is it. The writing level is phenomenal for my pencil-phobic boys. It needs to be something that doesn't require a lot of effort from me. Because, frankly, I don't have time. Visual Latin fits this too. I make sure the videos are loaded on the iPad, and I make sure I've printed the worksheets for them both. The boys usually do the first viewing and the worksheets (giving me the worksheets to look over). I usually sit with them to watch them through the second time. More on that below. Something that doesn't cost a fortune is a plus. And Visual Latin -- especially considering I buy it once and can use it for all my children just for the cost of printing out three pages per lesson -- is not expensive. It isn't cheap, but it is a great value. And if you act fast, there is a coupon code good for 30% off through tomorrow! HEFM30 is the code for that... it is a deal through the Home Educating Family Magazine that was set to expire today. Thomas said he'd extend it through tomorrow for my blog readers! It can't be something that takes a ton of time. This doesn't. Short videos -- three per lesson, totaling roughly 20 minutes. One worksheet per video segment. 5A: the A lessons are grammar lessons, mostly using English. 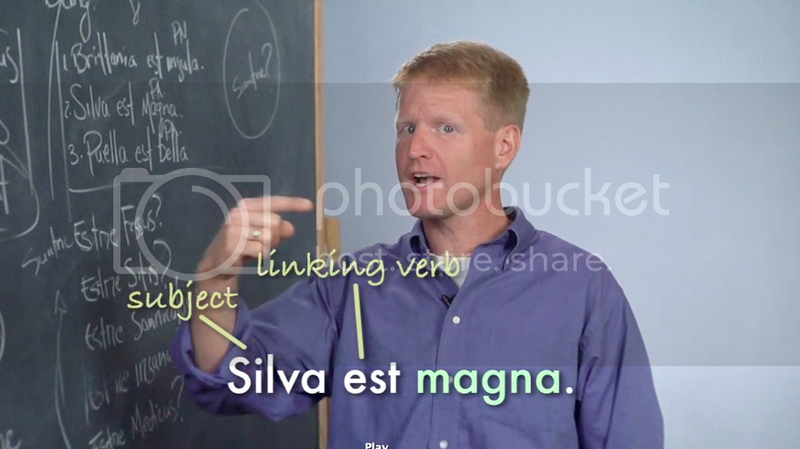 This video is 8 minutes of talk about nouns, the five declensions and the six cases (nominative, genitive, etc.) The worksheet involves English examples, labeling those six cases. 5B: The B lessons are "sentences" lessons. This part is taught in English but uses a lot of Latin. 9.5 minutes, and 5B is the lesson where you start seeing charts, and you are supposed to start memorizing endings. The worksheet includes the charts, and 16 words where the kids identify the case and whether it is singular or plural. 5C: The C lessons are the reading lessons. This 3 minute video is almost entirely in Latin. 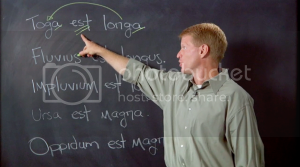 He reads a Latin story (from the Latin Vulgate; printed on the worksheet and on the video) at a normal speed, then he reads it one sentence at a time, pausing so the students can repeat. The worksheet consists of translating the story into English. This lesson includes sentences like: "Deus dicit 'Divide aquas!'" In a home setting, the advice is to do all three parts of the lesson (video, worksheet, video, worksheet, video, worksheet) one day. The next day, the student would watch all three videos again, back to back. Then move on to the next lesson, and watch it all... so you'd be doing two lessons per week. With my rising 5th and 7th graders, we are moving at about that pace, though it's been tough over the summer with camp, volunteering at the bookmobile, summer reading programs, etc. Monday: do 5A and 5B completely, and watch 5C without doing the worksheet. Tuesday: watch 5C again and do the worksheet, then watch 5A-C back to back. Wednesday: do 6A and 6B completely. Friday: watch 6A-C back to back. My struggling readers just love the fact that they can read these stories in Latin and understand them. They complain a bit about writing out the translation (they are pencil-phobic) but they really do not grouse about the other worksheets. I love that these lessons are not highly edited. Dwayne talks right at my students, and he makes mistakes sometimes. Sometimes he catches it and corrects them himself. Sometimes the correction shows up written on the page with arrows. I cannot even begin to express how amazing it is that my kids see an adult not being perfect... especially since he would have the ability to do another take and get it right. I love that it is relaxing. Can you even believe that? "Learning Latin" and "relaxing" shouldn't be in the same sentence, unless they are in opposition... like, "I wanted to spend the day relaxing, but my mother insisted I should instead be learning Latin." My recommendations? I think this program is phenomenal. I'm going to have William and Thomas continue using it, probably for as long as there are more lessons. Dwayne clearly loves language, loves Latin, and that just flows across the screen. Currently, there are 30 lessons, which you can purchase in 10 lesson sections. The first 30 lessons would prepare a high school student to use the first 17 lessons of Lingua Latina by Hans Orberg, which would combine for a solid first year credit in high school Latin. Lessons 31-40 are supposed to be coming out next month, with Lessons 41-50 scheduled for January, and 51-60 in the spring. Connor and I are having a serious conversation about whether he wants to watch through the first 30 lessons of Visual Latin, and then jumping in "for real" with lesson 31. (He has already worked through the first half of Lingua Latina a couple of times.) From looking over the materials and the scope and sequence (and sneaking the iPad to watch on his own), Connor feels that this covers the same material (but in a different order) as other first year Latin programs. "I have never heard the case made about how languages devolve, and that was really great. And the fact that Mr. Thomas is so funny is a definite plus. He makes you want to watch, and then you can't help but learn." You can see the introductory material for yourself, plus the first two lessons right here. Go. Watch it. Make some decisions. Because through tomorrow, HEFM30 means you could buy the first ten lessons for $17.50 (download version, single family use). I'm rushing over to get the next two sets. And I'll be purchasing more lessons in August. Disclaimer: I received the download version of Visual Latin lesson 1-10 in exchange for writing a review. I was not required to be positive, and all opinions expressed are mine or those of my kids. Loved the review Debra. For sure change my interest form to "Very Interested"! I actually think that John Allen, my oldest, would thrive with this. I am so excited for this program! What a wonderful review - thanks for sharing with us how you broke down the lessons in the week. I can't wait to see how my 10 and 13 yr old boys respond! Thanks for a great review. I'm glad to find SOMETHING for a visual learner regarding latin! !